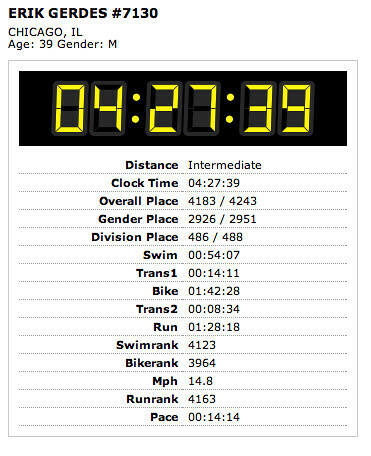 Hey, I completed the Chicago Triathlon today! Thanks so much to all the encouragement from friends and family - especially Erica, Shaun, Kristen, Jodi, Noah, Stephanie, and Scot who all came down to (or stayed at) the course to cheer me on in person. Nice work. I hope I can pull off an equally impressive finish for the Bucktown 5K in about a month. And by "impressive," I mean, "finish without dying." WAY TO GO FUZZY!!! YOU ARE AN IRON MAN! yea! we're so proud of you! we were cheering you on from here. did you hear us?